Wow. Today was incredible. 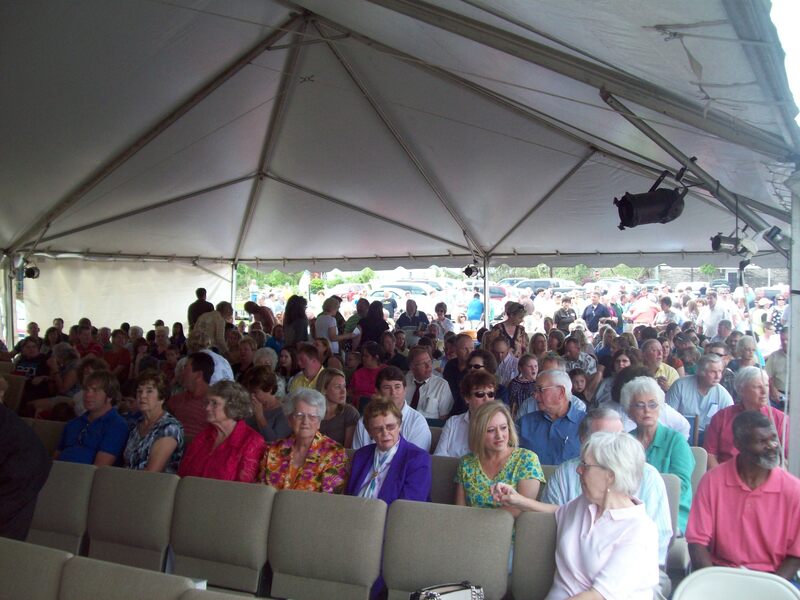 After two days of preparations, we finally held the worship service in the church parking lot under a massive tent. I have never been to a more emotional worship service in my life. People began pouring in about 45 minutes before the 11 AM service, all of them hugging friends and most of them wiping tears from their eyes. Camera crews from the Associated Press, the Northeast Mississippi Daily Journal, CNN, ABC News, the Memphis Commercial Appeal and other media outlets arrived to film our time of worship. About ten minutes before the service, I gathered with my Dad, Todd, and the deacons of Smithville Baptist Church for prayer. Just moments into the prayer, every man in our circle was weeping and praising God for His goodness and mercy. We prayed prayers of thanks and adoration as well as asked God to move mightily in our midst their. We asked that God would grant hope to the people of Smithville and that we would see the town rally around His mighty name. And we asked all of these things with the paparazzi behind our backs and over our heads snapping photo after photo. We couldn’t have cared less…we were in the presence of the Almighty God of all comfort, praising His holy name. What a sweet moment. 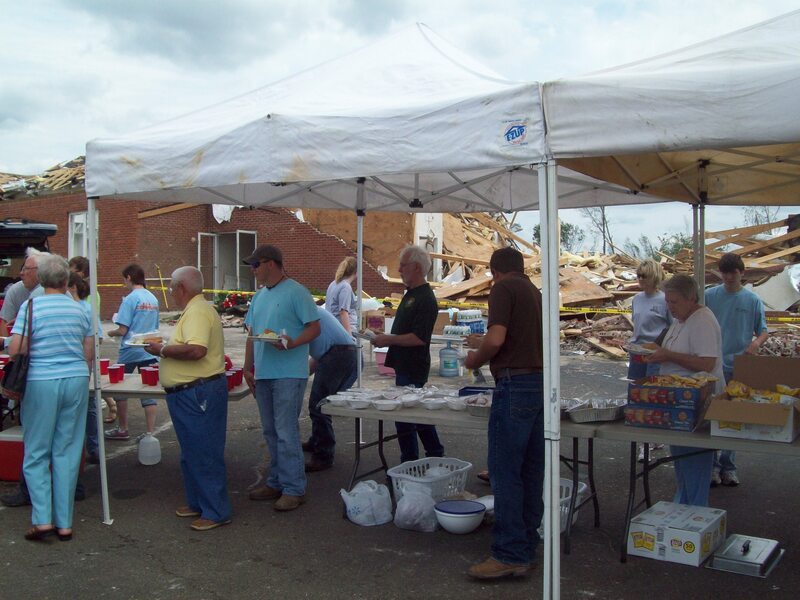 Smithville Baptist normally sees around 250 people on Sunday mornings. This Sunday, however, was a much different story. The tent we had rented seated 300 and many more sat in overflow seating out the back and sides of the tent as well as watched from afar atop their vehicles. 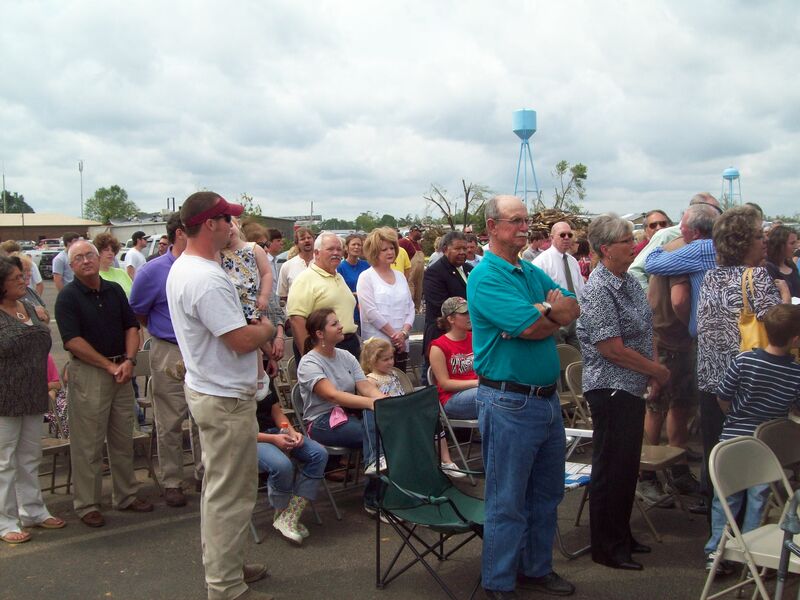 The deacons reported that between 400-500 were in attendance. I’m convinced we saw every bit of 500 people in worship. Todd began the service with a stirring welcome. He opened with “I am so proud to welcome you to Smithville Baptist Church,” which was followed by a very long and raucous ovation. 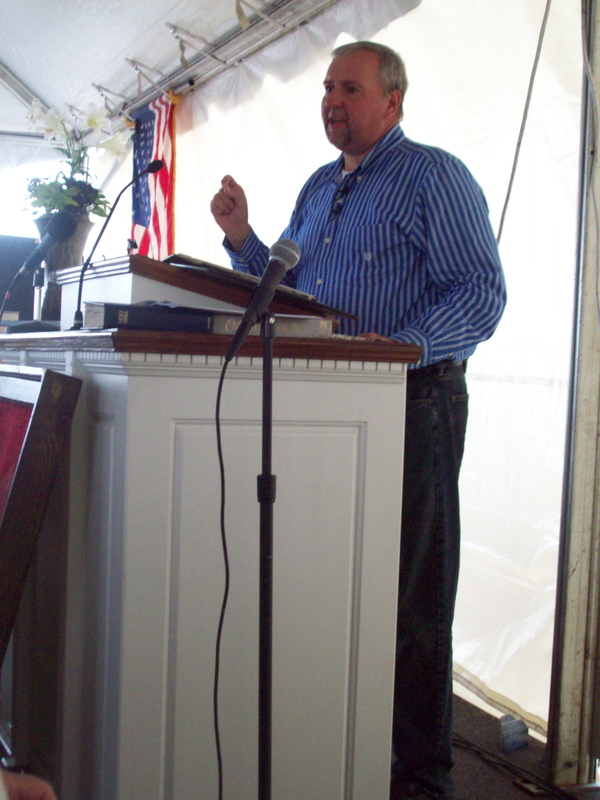 He ushered in the service with a call to hope on the Resurrection power of Christ. Then we sang hymns and worshiped together, which brings me to a caveat. I am an unashamed proponent of contemporary and modern worship music, particularly in churches that want to present an evangelistic service. However, I discovered today that there is an extraordinary comforting power, even for me, of singing hymns with God’s church. As we sang Because He Lives, All in All, and How Great Thou Art, it felt like God wrapped a warm blanket around my soul. I did not make it through a single song without reflecting on the rich and poignant lyrics and bursting into tears. I love my modern music, but God used hymns today to draw me into His presence, and for that I am exceedingly thankful. After the songs, my Dad stepped up to the microphone and delivered a 25 minute masterpiece of a sermon on the resurrection of Lazarus. He proclaimed that God is a God of comfort, that He feels deeply for our losses, and that He is where we should turn in times like these. At the end of the service, approximately 10 people came forward to give their lives to Christ. I had the distinct privilege to counsel two women in this decision. In all, this was an extraordinary worship service that I will never ever forget. God is so good and so gracious! 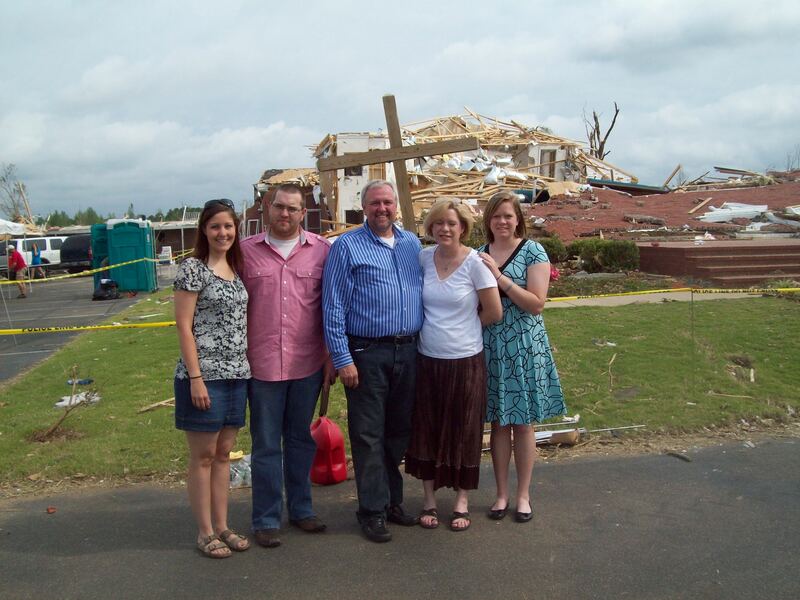 My family in front of the devestated church building. 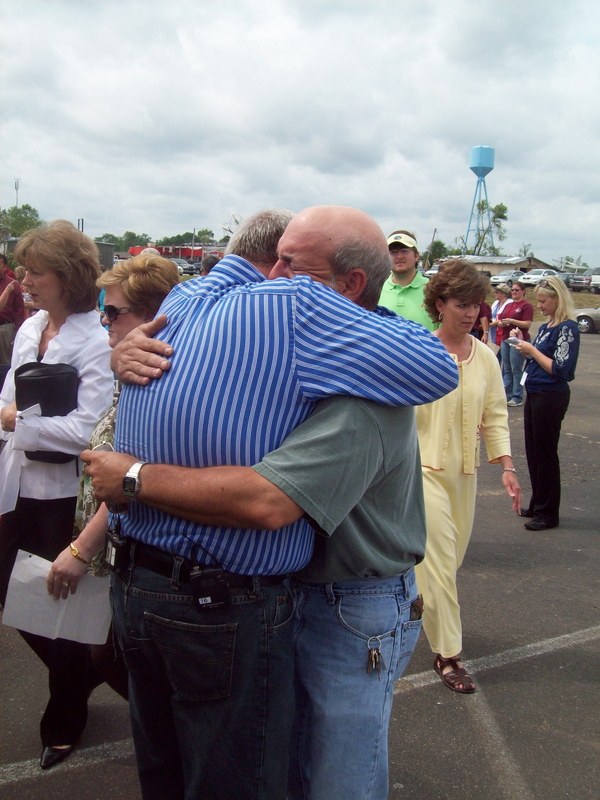 Pastor Dad shares an emotional moment with a man from the church before the service began. The crowd spills out the back of the tent. Part of the overflow crowd. 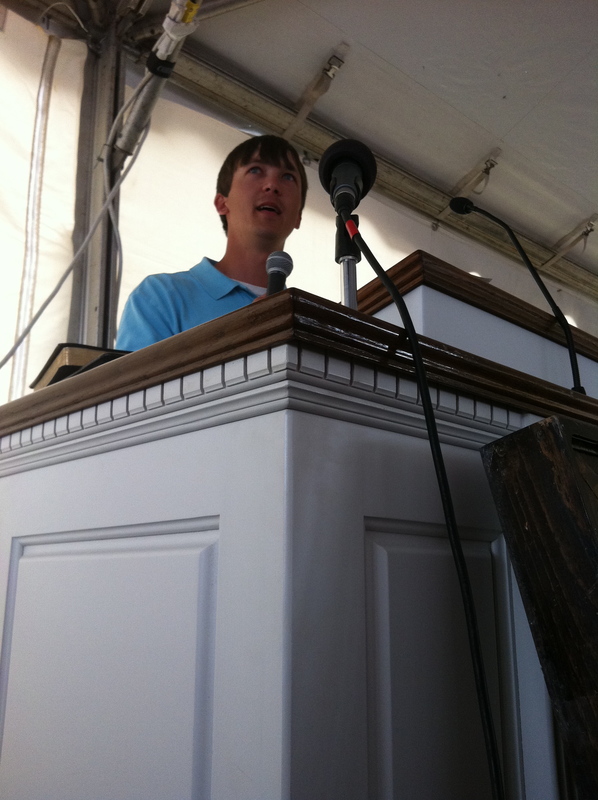 Really proud of my boy Todd Summerford for how he lifted Christ high today. After the service, we all ate lunch together, which was donated (for 500 people!) by one lovely lady from Tupelo, Mississippi. The Memphis Commercial Appeal wrote a lovely recap of Sunday’s service HERE. The Associated Press wrote an article on the service that was distributed all over the nation, from Portland to Cincinnati to Atlanta HERE. The AP’s photos of the service can be found HERE. All I can say is glory to God for the love, peace, grace and mercy He is providing to all of you. We love you guys and are praying daily for hearts to turn to Him..